The WÜSTHOF brand has a fantastic reputation in the world of knife production and sharpening. Originating in Solingen, Germany, the company is now 200 years old, with 7 generations of the Wusthof family present at the helm since 1814; a remarkable fete in today’s age of company mergers and acquisitions taking the personality out of many a small business. Not the Wusthof is small anymore. From humble origins the company now exports their precision knives and sharpeners all over the world. Here at Sharpen-up we are now about to take you through the some of the most popular Wusthof knife sharpeners currently available. The Wusthof 3 stage electric knife sharpener was designed specifically for the Wusthof “Precision Edge Technology” (PETec) range of knives. 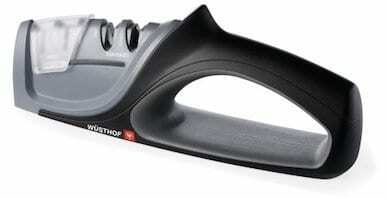 In short, if you have invested in buying Wusthof knives, you should seriously consider purchasing a Wusthof Sharpener. That being said, all the sharpeners reviewed in this article will work with any other brand of knife as well. 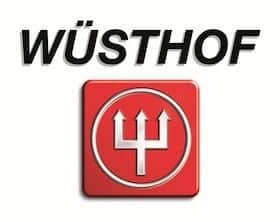 In short, the Wusthof 3 stage knife sharpener is able to restore the original factory angle that is present on the Wusthof range of knives when brand new. However, as we have stated, as well as sharpening the straight and serrated Wusthof knives, this tool will sharpen American and Western style kitchen knives too. The “PEtec” system involves a hi-tech computer-controlled mechanism that ensures precision-based sharpening each every time a knife is passed through the sharpener. The product is a 3 stage system, with Stage 1 containing 100% diamond abrasives, to precisely sharpen your dull blades. As with most 3 stage electric sharpeners, Stage 2 is designed to hone the blade using finer grit diamonds. Stage 3 is in turn used to polish the blade. Using ultra-fine stropping material your knives will be given a razor sharp edge. If you need to sharpen any serrated knives, these should be used in the third stage as well. Such results do come with a tiny caveat however. With edges finished to such razor sharpness, you do need to be careful when using your knife afterwards. 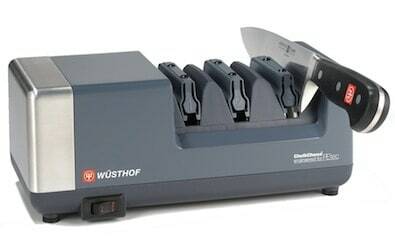 As you would expect with a 4 stage manual sharpener from Wusthof, this product out performs many traditional models, allowing for straight-edge, hollow-edge and scalloped edge knives. Unlike the Wusthof electric sharpener, the tool is not designed with just PEtec knives in mind, making it suitable for almost every knife in your kitchen. The Precision Edge accommodates two types of sharpening. The standard sharpener uses carbide blades set at 28 degrees or 14 degrees per side to give a precision-sharp edge on your standard kitchen knives. Stage 2 of the standard side uses ceramic rods to hone your blade. Again, carbide blades will place a fast edge to your knives, with the stage 2 ceramic rods fine tuning the blade. Simple and easy to use, this Wasthof manual sharpener is lightweight and very budget friendly. That is a small price to pay for a superior brand such as Wusthof, a company renowned for the high performance and quality of their products. Wusthof produce a series of sharpening steels, ranging from the budget friendly 10 inch steel options retailing at around $30, to higher priced diamond and ceramic steels that cost between $60 and $70. The Wusthof lower priced steels, represent great value for money however. Forged from a single piece of high-carbon, no-stain steel, you will achieve great results with this 10 inch standard model and it is perfect for maintaining your knife’s cutting edge if used regularly. The tool is also fully balanced for ease of use, is magnetic in order to conveniently attract loose metal fibers, and is equipped with a slip-resistant handle. The big difference with this sharpening rod is the fact that it can actually sharpen dull edges, rather than simply realign (hone) your blades as most other rods do. This is because it is made from ceramic, and contains fine abrasives that are a hard enough to create a new edge to your knives. This is one of the higher end Wusthof Sharpeners, however, if you wish to sharpen your knives using a ceramic steel – there is no better choice. Much like the other sharpening steels in the series, the tool is well balanced, and contains a slip-resistant handle for stable use.